More than two years since it shelved the project, the U.S. Army Corps of Engineers will take a new look at a deep-draft port in Nome. 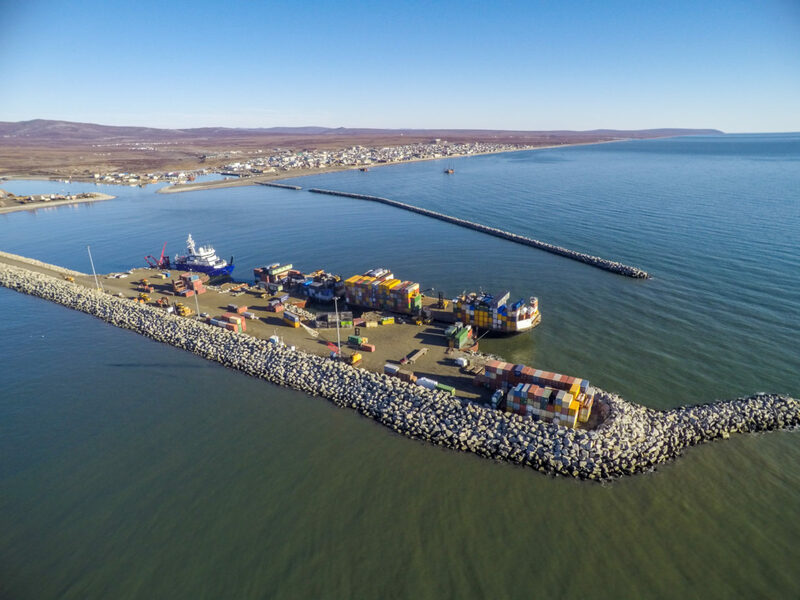 The Army Corps and the City of Nome entered into a formal agreement last week to split the cost of a new study of the regional benefits of a port expansion in Nome. A deep-draft port able to handle large ships would be the first of its kind in US Arctic waters. According to Nome’s mayor Richard Beneville, that’s significant. Beneville’s vision for a maritime Arctic starts in Nome but would eventually see ports throughout the region. He says it will help diversify Alaska’s economy, beyond dependence on oil and gas extraction. And he sees it as a way to make the most of record-low sea ice levels. It’s a vision shared by Alaska’s congressional delegation. One of the loudest voices in Washington calling for a Nome deep-draft port is Senator Dan Sullivan. Last week’s announcement starts an investigation by the Army Corps into the potential impacts of expanding Nome’s port. That study could take up to three years and cost as much as $3 million, which the Army Corps and City of Nome will split evenly. The City has already secured $1.6 million from the state for this purpose, and City officials hope the investigation could be completed in less time, thanks to existing research. The Army Corps singled out Nome as the best spot for an Arctic deep-draft port in March of 2015. “And that is when Shell pulled out of the Chukchi and ceased operating in their oil and gas development, and the regional study was essentially paused,” Joy Baker, Nome’s Port Director said. Baker says with Shell out of the Arctic, the Army Corps felt they’d lost the economic justification for a port expansion. Instead of moving ahead with a Nome-specific study, the Corps put the project on hold for at least a year. But getting started again has taken longer than that. Nome City officials worked closely with Alaska lawmakers to restart the project. Despite the halt in official action, Baker says these last 2 years and 4 months have been busy. Baker says the key was getting the Army Corps to understand that things work a little differently in a remote, rural location. Baker says it’s easier to justify the expense of an infrastructure project in a densely populated city in the Lower 48. With dimming prospects for oil and gas development, Baker says they had to make the case that expanding the port would do more than just boost Nome’s economy. Sullivan says broadening the Corps’ scope was a challenge. “This was part of my frustration, because Nome plays an important role as a regional hub to many of the smaller communities throughout Western Alaska,” Sullivan said. Baker gives Sullivan and the rest of Alaska’s congressional delegation much of the credit for getting the deep-draft port back on the table. Alaskan lawmakers pushed for changes to the Water Infrastructure Improvements for the Nation (WIIN) Act, which allow the Corps to consider benefits to the region as a whole and not just the city of Nome. They added language to the 2017 National Defense Authorization Act on the strategic importance of an Arctic port. Sullivan, who serves on the Senate Committee on Environment and Public Works, put a hold on the nomination of the assistant secretary of the Army for civil works, to press the issue. In December, the Corps issued a memorandum recommending they pick up where they left off and begin a feasibility study of expanding the Port of Nome. “It happened, so. Now we’re moving forward. I’d like to put the shovel in the water before I retire,” Baker said. By her own rough calculation, that means Baker could be putting off retirement till at least 2023. City officials and representatives from the Army Corps will discuss the budget, schedule, and scope of the study at a planning meeting scheduled for late April in Nome.